From Senior portraits, family portraits, pets as well as farm shoots, portraits of your horse, to the show ring or event, we can suit your needs, serving all of Wisconsin and surrounding states. Please contact us for show and event availability. Please visit the Preparing for Photo Shoot page also. All shoots include the pre-shoot consultation to get to know you, you and your pet and/or you and your horse, to provide the best service possible. We also include your own private on-line viewing gallery of your photos. There will be a reasonable travel fee if more than 40 miles from Pittsville. In your shoot you may include liberty, portraits, conformation, action, head/eye and any artistic and creative shots. We will work with you to create exactly what you want. *One hour per horse and/or person, up to 150 shots to choose from. *Private online viewing and ordering gallery. *One (1) 8x10 print included of your choice from your gallery. *Digital retouching and enhancements billed separately. *Photos on disk for your personal use available separately. *Commercial and editorial use available for a small fee. *Ordering extra prints available. Contact for pricing and sizes. *Personal website usage with permission. We will work with you to customize any package to suit your needs. Flexibility is one of our specialties! Please contact us to discuss anything you have in mind. 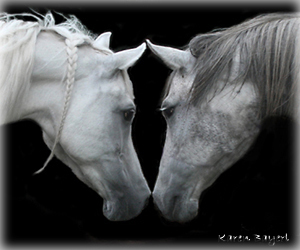 Adoption horses from the Midwest Horse Welfare Foundation, Inc., receive a discount on any packages and photo shoots. We can go anywhere our imaginations will take us. You may have a photo that I’ve taken for you and you want something extra-special created from that image. We can talk about that before I’ve done your shoot or any time in the future, as your photos are archived with me indefinitely. You may have a photo of your own that is good and you want to make it great, to have a more special keepsake. It is as easy as you sending me your JPEG image via email to receive some special touches. We can keep it as simple as removing an unwanted garbage can or clutter in the background, removing a halter, to completely changing the background, giving a person a little face-lift, clear up blemishes, remove braces and everything in between. I look forward to helping you bring out more beauty, creativity and use our imaginations in your images and mine. Please visit the Before and After gallery for a few examples, and contact me for more information.